Amongst the charred remains of once tall trees and the blackened, barren mountain slopes there is already hope of rebirth. In the years that will follow, the burn scars will slowly fade. In the blackened earth, grasses and wildflowers will spring up from the ashes. Over time, tiny pine trees will take root and and stretch their limbs up towards the sun. It’s so easy to look at the aftermath of the fire and only see loss and destruction. We often forget that with the pain and destruction of a fire, nature also offers the hope for cleansing and rebirth. At the same the Mountain Fire was destroying what we loved, it was it creating something new and beautiful, shaping the new forest to come. Even as the flames crackled through the branches of our manzanita, cedars and pines, this new forest was already being born. Many tree species, like our native Coulter pine, have adapted to survive and even thrive after a forest fire. Their cones shelter seeds in shells that are so tough that only the intense heat of a fire can set them free. The Mountain Fire dumped millions of these seeds on the forest floor. In less than a month, a fraction of those will begin to germinate, pop their heads up through the soil and start growing into little seedlings. Not only will the ashes of the old trees serve as Miracle-Gro for a crop of windflowers and hopeful pine seedlings, the clearing of the undergrowth will open up more nutrient and water resources for the older trees that remain, strengthening them. With the recent influx of cooling rain, our singed meadows and streams, have already slowly begun their recovery. Fire ecologists say these areas closest to water will be the first part of our high country to regain their full majesty. Mother nature will do all this and more to not only restore, but to rejuvenate and re-imagine our forest into a beautiful new place. Fire is change, yes, but change is not necessarily a bad thing. 1. Give it time to heal. We all want to get up there and see the damage, take stock of our losses. The urge is almost irrepressible- we are drawn like a bystander at a gruesome accident. But before you decide to sneak up for “just one look”, remember, this is a very fragile time for our high country. 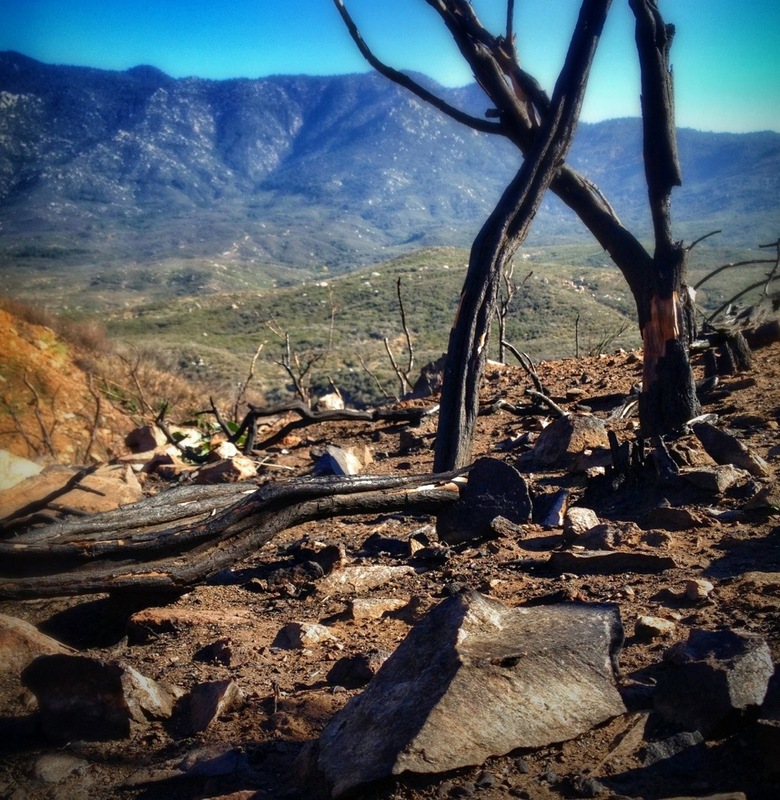 The most critical long-term issue for a forest after a fire is erosion. Without plants to hold the soil in place, erosion can strip nutrients from the soil and make the earth too unstable to support new growth. The recent rains have already ravaged the burnt areas. Traveling this already fragile earth can do much more damage than you know. Allow the forest time to heal, give it space that is needed to rebuild without excess foot and horse traffic that could degrade already fragile areas. “But, what harm could just one person do?” Well, not much, but you know it won’t be just one person that goes up. You could choose to make one less set of footprints to damage the soil. 2. Respect the Forest Service rules and timeline. Rest assured, they are not closing the Wilderness just to punish you. They set the rules in place to protect you and more importantly to protect the high country from overuse during this delicate time. NOTE: Even after the flames are long extinguished, that does not mean that the danger for visitors to the high country has disappeared. Many charred trees are unstable, ready to fall, waiting for some impact to trigger their release. New holes and ruts hidden just below the surface from burnt out roots wait to twist unwary ankles. 3. Volunteer to help rebuild. Before the Wilderness can be re-opened the. Already severe erosion will need to be dealt with, damaged trails repaired, reinforced, possibly even rebuilt entirely. If you want to do something for the High Country you love, donate to, or volunteer to help with a trail maintenance program. The Forest Service Volunteer Association (FSVA), the California Conservation Corps (CCC) and the Pacific Crest Trail Association (PCTA) have long worked to preserve our local trail system and they will need all the help and funding they can get in what promises to be a challenging year.